This headstone in Hilgay Churchyard, Norfolk, jumped straight out at me when I walk around the corner of the church, I have never seen one like it before. I was quite fascinated by it and wondered if John Whittome had been a miller. So I did a bit of researching to day and found out quite a lot of John Whittome, who was a Millwright and also became a Miller. 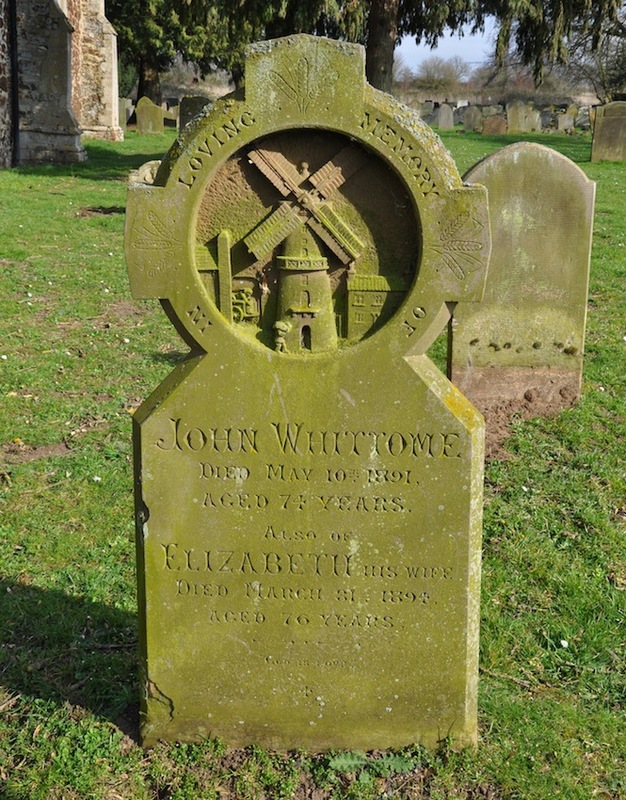 John Whittome died in 1891 and was buried in Hilgay churchyard, to the south of the church. The distinctive headstone has the carving of a large tower windmill with a stage, possibly Denver Mill, and was inscribed:Wheel & Millwright, Joiner & General Smith. The Whittome family ran The Hilgay Post Mill (which stood for 250 years) and also The Hilgay Smock Mill. John had also been a Corn Miller from 1868 to 1883. The Smock Mill was used for grinding corn, and had a pair of fine French dress stones. John built a house in the village with a foundry and steam mill nearby. Sad to say that that not any of the mills survive today. It is a wonderful headstone to commemorate the life of a Millwright and Miller. What a lovely story, and I think the headstone is just beautiful – you can see how much care and skill has gone into it. I’m sure that Mr Whittome would have loved it! 🙂 You’re worse than me! I visted this churchyard when I was researching family history a couple of years ago. I was amazed by the headstone and glad to see that it has survived so well. The name ‘Whittome’ also held my interest, as I am a descendant of the Whittomes of Whittlesey, who were farmers and land owners. Was John Whittome related to them? In 1845 William Whittome, formerly of Whittlesey, was an innkeeper in Hilgay. My ggg grandmother, Elizabeth Skelton, nee Whittome, moved to Hilgay after her marriage to Robert Skelton, who took over as decoy keeper in 1825. Shortly after they moved to Modney Hall Farm. All their chldren were baptised in Hilgay church until they moved to Holme Fen, Huntingdonshire, in 1838. My maiden name was Whittome and I have met no one with the name until recently. I know little of the family history only that my father was the twelfth of 13 children and at least one brother was killed in WW1. I believe his father was William. I’ve read your response to Pam Hornby regarding the name Whittome and I am willing for you to pass on my email details. I might be able to help Pam with information that I have discovered via Ancestry website and general ‘googling’. It’s also nice to meet another distant relative – assuming she is related. Hi, those of you who have Whittome ancestry, has anyone found an Elizabeth Whittome in Whittlsey, b about 1786, who married a John Allick, or Allix. After John had died she married a Henry Goode. If so I would be really interested to hear from you. I have her on the 1841 census as Elizabeth Goode, with two of her sons, John and Robert Allick. 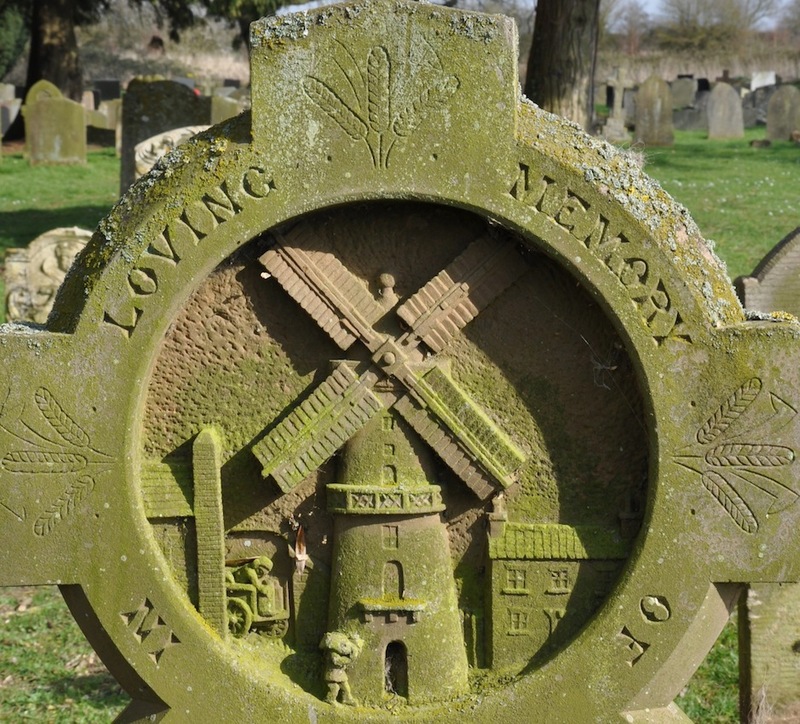 I thought I would reblog this post of 2014 to go with my recent one on windmill headstones.